Alexandre Ribeiro (born January 20, 1981, in Manaus-Amazonas, Brazil), is a Brazilian Jiu-Jitsu practitioner, mixed martial artist and submission wrestler. He is a two-time World Black Belt Absolute (open weight) World Jiu-Jitsu Champion, five-time World Black Belt Heavy Weight Champion, and three-time World Black Belt Pro Division Champion. Xande was born in Manaus, Amazonas Brazil and moved to the US in 2002. He began training Jiu-Jitsu at the Associacao Monteiro de Jiu-Jitsu under the supervision of Binho, Guto, Yano e Lucinho Monteiro. He lived in Toledo, Ohio, for 5 years, after in 2007 he moved to San Diego, California, where he teaches at the University of Jiu Jitsu and trains MMA at The Arena MMA. 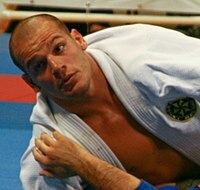 Xande Ribeiro has a brother, Saulo Ribeiro, who is also a Jiu-jitsu and submission wrestling champion. They have both won multiple ADCC and together, they hold the most titles in World Brazilian Jiu Jitsu Championships. ^ a b c d "Xande Ribeiro's Sengoku profile". ^ "- SENGOKU 5 WEIGH-IN VIDEO AND PHOTOS". ^ "ADCC Results 2005". Official ADCC results. Archived from the original on September 8, 2011. Retrieved September 25, 2011. ^ "ADCC Results 2007". Official ADCC results. Retrieved September 25, 2011. ^ "ADCC Results 2009". Official ADCC results. Retrieved September 25, 2011. ^ "2004 World Jiu-Jitsu Championship results". Archived from the original on 2008-09-19. ^ a b "2006 World Jiu-Jitsu Championship results". Archived from the original on 2009-08-03. ^ a b "2007 World Jiu-Jitsu Championship results". Archived from the original on 2009-09-04. ^ a b "2008 World Jiu-Jitsu Championship results". Archived from the original on 2012-05-31. ^ a b "Mundial 2010". Official IFBJJ results. Retrieved September 25, 2011. ^ "Mundial 2012". Official IFBJJ results. Retrieved September 7, 2012. ^ a b "Pan 2006". Official IFBJJ results. Archived from the original on September 28, 2011. Retrieved September 25, 2011. ^ a b "IBJJF Pan-american 2005 result". Archived from the original on 2009-08-03. ^ a b "IBJJF Pan-american 2002 result". Archived from the original on 2009-08-03. ^ a b "IBJJF Pan-american 2001 result". ^ "IBJJF Pan-american 1999 result". ^ "IBJJF Pan-american 1998 result". ^ "Alexandre Ribeiro BJJ (GI) career on MARanking| MARanking Martial Arts Ranking". Maranking.com. 2014-01-18. Retrieved 2014-01-18. This page was last edited on 23 January 2019, at 12:32 (UTC).